The problem to be solved is placed in the box on the far right. It should be a well defined problem with a narrow focus, or the chart will get too large. The spine is a large horizontal arrow that points to the problem box. The lines diagonally pointing to the spine are the main categories of potential causes of the problem. The smaller lines are more detailed causes of the problem. 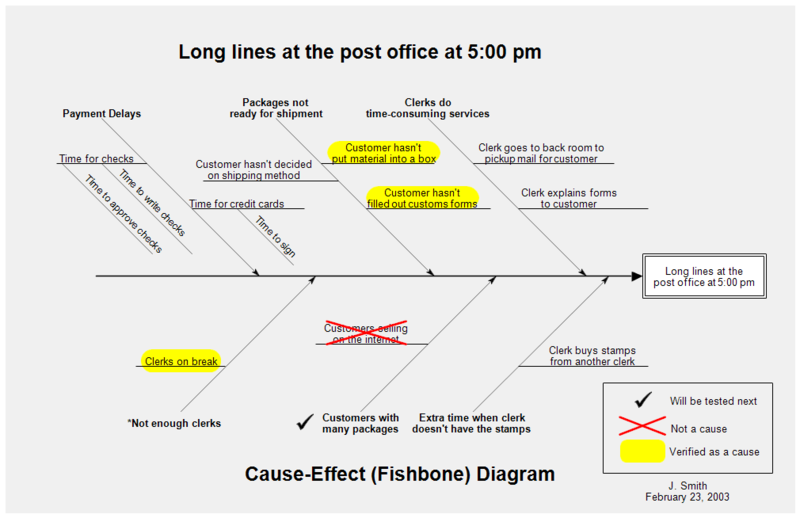 Once RFFlow is installed, you can open the above chart in RFFlow by clicking on fishbone-post-office.flo. From there you can zoom in, edit, and print this sample chart. It is often easier to modify an existing chart than to draw it from scratch.